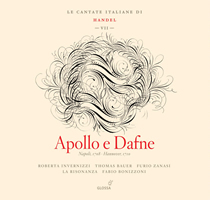 We are delighted to award first prize to Fabio Bonizzoni, La Risonanza and Glossa for their recording of Handel's dialogue cantata Apollo e Dafne. Probably started in Venice but completed at Hanover in 1710 in the months shortly after Handel left Italy, the enchanting tale of the braggart Apollo falling head over heels in lust with the reluctant nymph Dafne inspired some of the composer‟s most attractive and emotionally diverse early writing. The cantata has rightly become established as one of Handel's most popular "Italian" compositions, and this captivating performance by La Risonanza forms a fittingly essential conclusion to Fabio Bonizzoni's ambitious project to record all of Handel's Italian-period cantate con stromenti for the Spanish early music label Glossa. Thomas E. Bauer and Roberta Invernizzi are to be praised for their outstanding singing, which is always aptly characterised and suavely stylish, and the playing of La Risonanza is gently dramatic and always beautifully detailed. The disc also includes an excellent performance of the dramatic soprano monologue Agrippina condotta a morire and the seldom-recorded bass cantata Cuopre tal volta il cielo (the latter sung by Furio Zanasi). The seventh and final volume of La Risonanza's "Le cantate Italiane di Handel" is the third of the series to be awarded the Stanley Sadie Handel Recording Prize (and another three were also runners-up in recent years); the panel of judges hopes that the critical and artistic success of this special project encourages La Risonanza, Fabio Bonizzoni and Glossa to continue exploring this repertoire. The panel of judges also congratulate this year’s close runners-up: a revitalising performance of Giulio Cesare conducted by George Petrou (Dabringhaus und Grimm), the Avison Ensemble’s intelligent interpretations of the Op. 6 concerti grossi and the Early Opera Company’s elegant performance of the anti-heroic opera Flavio (Chandos Chaconne). The panel hopes that all of the artists and labels nominated for this year’s prize will be encouraged to continue producing fresh insights into Handelian repertoire. It is an annual award given to one distinctive new recording of Handel’s music, chosen by a specially invited panel of scholars and journalists who each possess a special and informed interest in Handel’s music. The winner is carefully selected from a comprehensive list of new recordings of Handel’s music released during the previous calendar year. The winner must satisfy tough criteria: it needs to combine fine interpretive quality with a penetrating or valuable insight into Handel’s genius. Thus this Prize is an indication of a recording’s quality and the significance of its contribution to Handelian knowledge. One of the prize’s founder panel members was the scholar, author and critic Stanley Sadie, and in 2005 the prize was renamed in his memory (its original title was the International Handel Recording Prize). We hope that this prize is warmly accepted as an appropriate legacy of Stanley’s unusual ease at mingling enjoyable journalism and superb scholarship together. In some respects it was influenced by the now defunct American Handel Society Recording Prize (1991–8), but in 2002 an international panel of judges inaugurated a broader forum to nurture recognition to a new recording of Handel’s music of noteworthy quality. This year’s winner was chosen by judges from Australia, France, Germany, Italy, Russia and Britain.